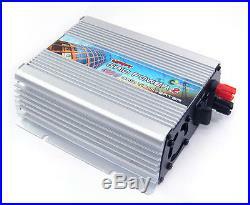 Grid Power II 400W MPPT. 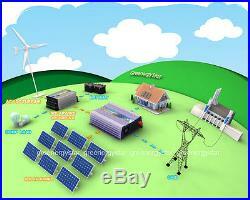 For Solar & Wind Hybrid Systems. 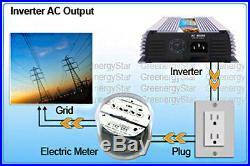 Generation Grid Tie Inverter. GreenergyStar Grid Power II 400W MPPT. Electrical Specifications – Output. Model: GP2-400W 2nd Nominal AC Output Power: 400W AC Output voltage range: 100 260V Auto Switching Frequency: 46Hz – 65Hz Total harmonic Distortion (THD): <5% Power Factor: 0.99 Island Protection: Yes, inverter shuts down during black out Output current waveform: True sine wave. Electrical Specifications - Input. DC input voltage range (Solar & Wind): 10.8V - 28V Peak inverter efficiency: 92% Over-current protection: 30A Reverse Polarity Protection: Yes Power consumption (Standby): 0.9W Stackable: Yes, unlimited. Operating temperature range: -20'C - 65'C Weight: 1.27kg / 2.65lb Dimension (L x W x H): 16.3 x 15.4 x 5.7 cm 6.3" x 6.10" x 2.25 Mounting: Wall Mount AC Cable Length: 1.5m Cooling: Convection cooled with fan Display: 1 Red and 6 Green LED. New Model: GP2A-400W 2nd Second Generation Normal Operation. AC Disconnected / Fault. Unique and intuitive display design - LED cycling in circular formation - Represent electric meter spinning backward and power is being output to the grid - Smooth motion. Grid-Tied - sell green power directly back to the grid at a premium rate (depends on your location) - Maximum Power Point Tracking (MPPT) - optimize power output - Plug and Play Design, simply plug into an outlet (GFI), no hard-wiring - Does not require rewiring of existing electronics - Compact and light weight design - 60% enhanced in power output compare to first generation inverters - 38% better in space utilization and 51% better in Weight Reduction with higher quality parts - Unique and intuitive LED display design to reflect power output rate - External 30A Fuse for easy maintenance - Automatic 110V - 220V AC voltage switch, NO MORE manual hassle - Wider DC Input Voltage Range, from 10.8V 28V compare to 1st generation's 14V 28V - Allow MORE types of power source to be connected ie: Air-X, 12V battery, and etc. Aluminum enclosure will act as heat sink to help dissipate heat - Stackable (connect in parallel for higher output) - Island protection: Inverter will shut down during black outs. Simple and safe installation - Reverse polarity protection - Generates pure Sine Wave - Constant Power Output - Low distortion output on all ranges - Allow different Power factor from loads. One GreenergyStar GP2-400W 2nd Hybrid Grid-Tied Inverter - One spare 30A fuse - One 1.5m North America Standard AC Cable - Instruction Manual. For more items, please view my other auctions. All pictures and descriptions are subjected to change without notice. We are not responsible for any inadvertent errors. Please refer to S&H price list above for details. Usually it will take 45 days for bounce backs to return to us. So, PLEASE make sure you address is correct. Items that are used/ damaged/ deformed or altered in any ways are not acceptable. 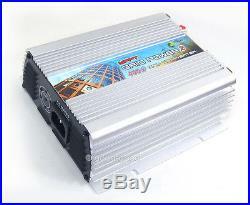 The item "400W10.5 V-28 V DC MPPT GRID TIE INVERTER Fit Ac 85 v-120 v/190 v-260 V 50-60 Hz" is in sale since Thursday, May 10, 2012. This item is in the category "Home & Garden\Home Improvement\Electrical & Solar\Alternative & Solar Energy\Chargers & Inverters". The seller is "goodsgood" and is located in Point Roberts, Washington. This item can be shipped worldwide.